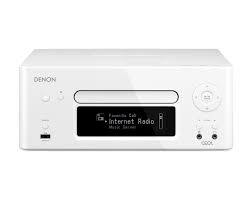 The Denon RCD-N7 is a Network-Ready Receiver/CD Player compact audio system. I had searched for some time for a high-quality, AirPlay compatible audio system for my kitchen. The Denon RCD-N7 seemed to fit the bill – it had AirPlay streaming capabilities and brought the best of mid-range audiophile capabilities in an affordable package. The unit cost about $650 without speakers and generally received good reviews, like this one. The unit is sometimes branded “CEOL”, which seemed to be a European product designation. The model is almost 2 1/2 years old at the time I am writing this, so I am wondering what Denon has planned for the next model. The audio quality on the unit is quite good, although I had to admit I am not exercising it fully because I have it hooked-up to a pair of Mirage NanoStat speakers, which are great for hiding-away but do not deliver much bass. If you listen to the RCD-N7 in the shop with an appropriately paired set of speakers, you will likely be impressed. The setup and installation of this unit almost drove me insane. The unit has WiFi capabilities, but I really struggled to get it working. It has a dipole antenna on the back, which led me to believe I might get good WiFi signal strength. However, I ultimately abandoned any attempt to use the WiFi and instead connected it with a D-Link Ethernet over Powerline solution. AirPlay really needs low latency for good performance, and I found the audio dropped on this unit when using AirPlay over WiFi. The user interface for setup and provisioning is pretty clunky. One of the key features of the RCD-N7 is the Denon iOS app for remote control – they improved it over last year, but it still is a poor example of App development. Also, the RCD-N7 uses a different remote protocol that some of the more pervasive Denon models, so there are no third-party apps for remote control. If you look for technical support or other user experiences on Google, it’s just not out there – this was unfortunate, especially when I was having problems. I had two occasions over the past year where my “favourites” settings for FM and Internet radio stations got erased for some unknown reason. Day-to-day, the unit performs pretty well but these couple instances were a bummer. I use the AirPlay capabilities to stream from my iTunes server, and this generally works really well. Overall, it is the best solution out there for my setup and desire to have an AirPlay compatible high-quality receiver with a remote app capability, despite the few kinks that persist. The bottom-line: Best solution I could find for AirPlay compatible high-quality audio, it’s a full featured unit that has been working well for me, despite the few rough edges and occasional glitch – overall, I am happy with the purchase.